Rakusan did not include the Fan Series in his main sequence numbering. Therefore, the original number used for each of the 36 Series prints has been modified to identify the Fan Series members of its theme. The five different fan silhouette shapes have been here assigned arbitrary numbers 1 through 5. To indicate a fan design these shape designations are added to the 36 Series number separated by a hyphen. 114-5 is the Fan Series design with fan shape 5 in the 114 Ivy theme. Like all other designs in this series, 114-5 was only produced in a single print run, and few copies are currently documented. The 114 Ivy theme is one of the many entirely regular themes represented by a complete fan quintet and a color woodblock print. The Fan Series prints of the 114 Ivy theme were distributed in mid 1934 in installment five (of twelve). The delivery documents for installment five remain to be discovered, but its delivery month was either July or August 1934. The woodblock prints would have been printed earlier in the same month as their distribution. 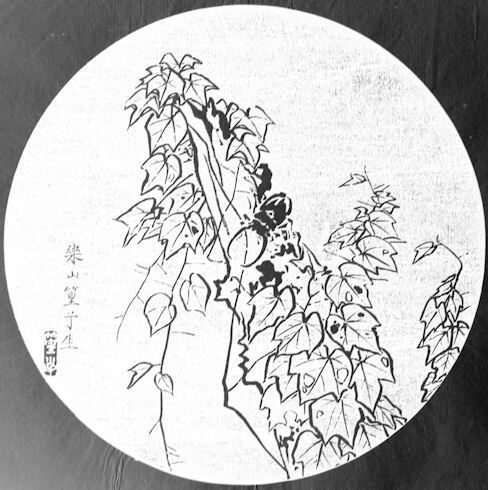 In the preview announcement on the installment four folio, Rakusan used 蔦, tsuta, 'ivy' as the title for this theme, and that is also the name used here. The individual designs in the 114 Ivy theme were completed in at least two stages. Three of the five fan designs (including 114-5) have seal C which indicates a carving date during the first half of 1934. The other two fan designs and the 36 Series design 114 have seal B which indicates a later carving period closer to the time of publication. At least some of these ivy designs were adapted from sketches originally created in the late 1920s for design 17 of the earlier 100 Series (see below). The composition of 114-5 includes an unidentifiable tree stump covered with ivy. On the stump is a stag beetle. The ivy and stump are rendered as a rather simple line drawing. The beetle is almost a silhouette. Both techniques work equally well viewed as ishizuri or as the reversed original. 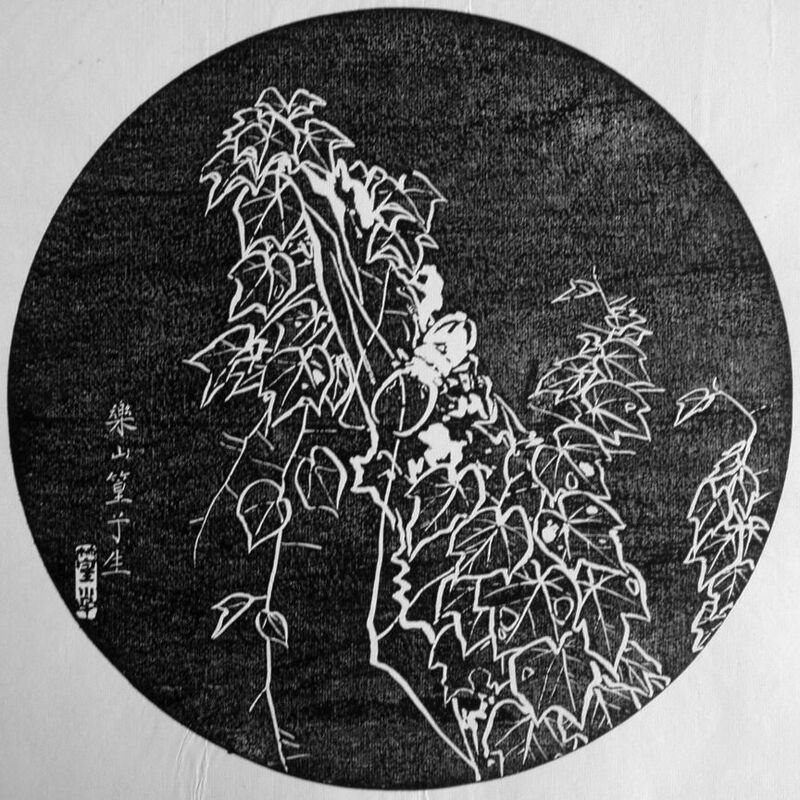 Japanese Ivy (Japanese Creeper, Boston Ivy, Grape Ivy), Parthenocissus tricuspidata, 蔦, つた, ツタ, tsuta, is a familiar Asian native vine now widely planted around the world. Although all of the 114 Ivy theme designs may be this species, some representations are so sketchy that they could equally represent other species of ivy. The general name for any stag beetle (family Lucanidae) is 鍬形虫, くわがたむし, クワガタムシ, kuwagata mushi, lit. 'hoe-shape insect'. The stag beetle Rakusan shows in 114-5 has a pair of long, slender, incurved horns which appear to lack any sort of toothed ornamentation which would permit species identification.